Greetings! I had the opportunity to attend a tourism event in Portland, Oregon this past weekend, so it has been a very busy time. I cannot wait to share the photographs and details of the trip. It is a beautiful part of the country and after this trip, I am ready to pack up the covered wagon and head Northwest! 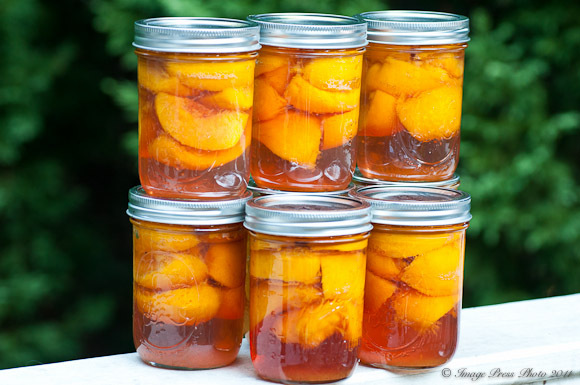 In the meantime (while I work out those details of packing and moving ;)), I wanted to share a recipe for one of our favorite canned foods, Brandied Peaches. As you might remember, I spent a tortorous very long weekend two weeks ago in the kitchen canning. It is hard work, I ‘m not going to tell you otherwise. However, once you get into the rhythm of things, you will find that it becomes easier. You will also be one happy camper when you have your own canned goods and do not have to rely on your local grocery store for everything. It will taste far better, too. I made Brandied Peaches last year and we enjoyed them throughout the cooler months when peaches were not available. They are very tasty by themselves. How could brandy and South Carolina peaches be anything but?! Better yet, serve them over homemade vanilla ice cream or with fresh whipped cream and pound cake. They are simple desserts, but quite delicious and are served up with lots of love from your kitchen! This recipe is an oldie, but a goodie. It it originally appeared in The New York Times in 1951. After all, the delightful combination of peaches and brandy hasn’t changed much over the years. However, the recipe has been updated to ensure safety in the canning process. 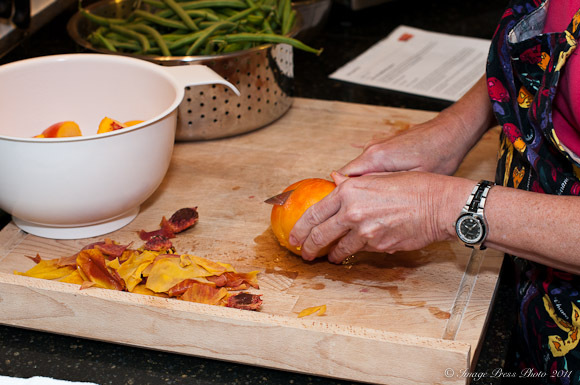 The recipe calls for cutting the peaches into quarters. Depending on the size of your peaches, slice them to a size that fits neatly in the jars (typically, quarters or eighths). The South Carolina peaches have been quite large the last two summers, so last year I cut them into eighths. This year I cut them into quarters as the recipe suggested. As I mentioned in the last canning post, you need to be flexible when canning and have extra jars, lids and rims sterilized and ready to go. I doubled this recipe since I was taking the time to do the canning. One recipe called for 2 pint-size jars, but I ended up with 3 pint-size jars per recipe in order to get them to fit nicely. This recipe appeared in an article in The Times by Jane Nickerson. Updated canning instructions were added by Eugenia Bone. You will need two pint-size wide-mouthed Ball or Kerr jars with bands and new lids, available at many hardware stores or online. * I doubled the recipe. If you are going to go to the trouble to can, you should make as many jars as you can. I needed three pint-size wide-mouthed jars per recipe rather than two. 1. Bring a large pot of water to a boil. Using the tip of a paring knife, make a shallow “X” in the bottom of each peach. Add the peaches, one at a time, to the boiling water and cook for 1 minute. 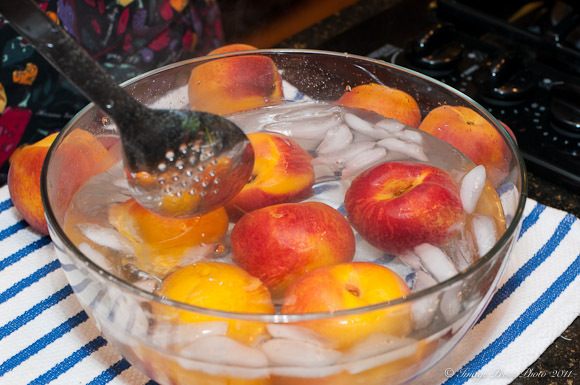 Remove the peach from the water and plunge into a bowl of ice water. Repeat with the remaining peaches. Peel off the skins, then pit the fruit and quarter the flesh. 2. In another large pot, combine 3 cups water and the sugar and bring to a boil. Add the peaches and simmer until just soft. 3. Have the jars, bands and new lids scalded and ready. (To scald, dip the jars and rims in boiling water. You don’t need to sterilize the jars, as you will be processing them for more than 10 minutes.) Simmer the lids in hot water to soften the rubberized flange. Gently pack the peaches into the jars. 4. Boil the leftover syrup until it thickens slightly, then spoon it over the fruit, filling the jars ¾ full. Use a butter knife to release any air bubbles caught in the jars. Pour in enough brandy to fill the jars, leaving ¼ inch of headroom. Wipe the rims, cover with the lids and screw on the bands fingertip-tight. Place the jars on a rack in a big pot and cover with 2 to 3 inches of water. Cover the pot and bring to a boil over high heat, then lower the heat to medium and gently boil for 20 minutes. Remove the cover and then, after about 5 minutes, remove the jars. Allow them to cool, untouched, for 4 to 6 hours. Check the seals and store in a cool, dark place for up to a year. Refrigerate after opening. * Cook's notes - If you are canning at a higher altitude, be sure to consult the Ball Blue Book Guide to Preserving for proper instructions and canning times. Hmmm, I guess I could do this with a metal cooling rack and a big pot or dutch oven, right? 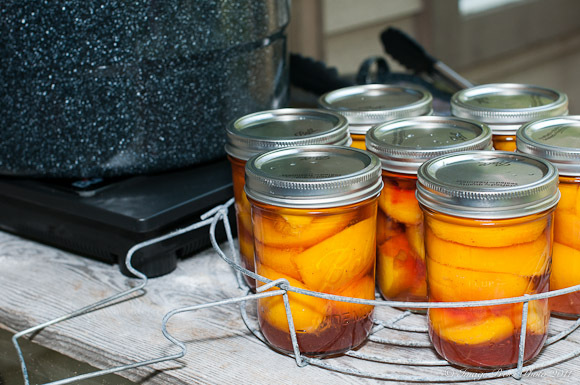 I have never canned but these peaches sound just delicious, especially over ice cream! Yum! I’ve wanted to cook peaches for a dessert this summer but I love the idea of preparing some so they can be eaten and enjoyed all winter long! I’ll leave the canning to you (I’ll pay the shipping to CA), but please have Mr. Bunkycooks prepare and enjoy one of his cocktails for me! Oh, what a fabulous way to enjoy summer peaches in the midst of winter! And I love the idea of using the leftover peach juice for cocktails…yummy! I’ve been just DYING to make brandied peaches, but I can’t find anything that just says “brandy” on it. Care to share exactly what brandy you are using? I used Remy Martin which is a French Cognac. Cognac is a type of brandy and it is what I prefer to use when cooking. Be sure to use a nice brandy or Cognac. It will definitely make a difference in the taste of your Brandied Peaches. If you wouldn’t drink it, then don’t use it in a dish or a recipe. I hope that helps! Canning is hard work…but it sure is worth it when you can pull out a jar of these beauties during the winter months! And thank you for sharing this delicious recipe! I’m hungry again (we just finished dinner a couple of hours ago). I want some icecream and peaches! Yummy and sweet…as always. Much love from Austin! could we do this with pears? the peaches are gone but I have a surfit surfeet surfet – well, lots of pears. surfeit, there you go, the right spelling. pears and brandy? how long do these have to sit before opening and enjoying? I would give them a at least few weeks to let the flavors develop and a month or two is probably best. Try to use them within a year as they are better during that time period, although they will hold longer. This may be the recipe that finally pulls me into the world of canning! 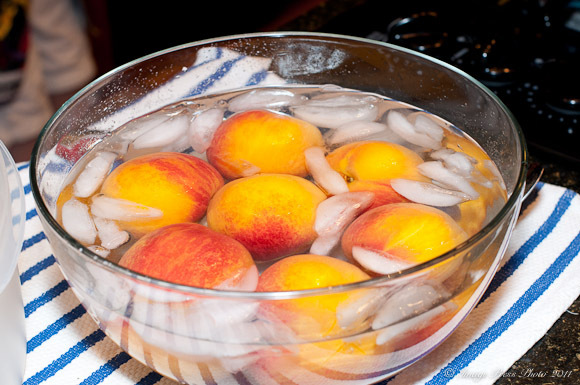 Your peaches sound amazing…I just need to pick up some jars. This is a great one to start with. BTW, it becomes addictive. Good luck! Hi, earlier today I canned brandied peaches according to this recipe. Your method for peeling the peaches is the best I have ever used. This is the first time I’ve seen the instruction to cut an “x” on the bottom of the peach before placing in boiling water, and it really works! One potentially big problem, however, is the amount of headspace you recommend. I used 1/4 inch as you said, and I think it is too little. I smelled brandy when I took the jars out of the hot water, and now my cooled jars are sticky and the cooled processing water smells like brandy – confirmation that liquid bubbled from under the lids during processing. I think the jars sealed but am waiting till tomorrow morning to really tap hard on them. (I had to go out after I finished so I don’t know if they “pinged”, but they don’t push down and pop back up.) The danger is that the syrup residue between the jar rim and the lid will prevent sealing. The Joy of Cooking specifies 1/2 inch headroom for fruit canned in syrup (including the JOC brandied peach recipe) and after today’s experience, I think 1/2 inch headspace for this recipe would be better. Thanks for the recipe and I am hoping it turns out – I want to give these as Christmas gifts to family. I hope that your peaches turn out well. I did not have any problems following the recipe as is. This is an older recipe from 1951 and 1/4-inch headspace (as it called for) was fine for peaches I have canned using this recipe. I’m sure that you probably know to do this, but always wipe the rims of the jars with a clean, warm wet cloth to remove any sticky residue before putting the lids on. I always go back over quickly and dry the rims with another clean cloth just to be sure I didn’t miss anything. They should seal properly if that is done and everything else is spot on. I have had some jars from various canning batches feel a little sticky after the canning process, but the jars still sealed fine. Please let me know how your turn out. Can you use this receipe with a pressure cooker? Or does it need to cook in a water bath? I haven’t made this using a pressure cooker, so I don’t know how they would turn out. I kept to the original recipe.